​The Devon and Exeter Racketball Open was a landmark on the UK-Racketball Series being the 50th tournament that we have run. It was a fantastic local entry both in terms of numbers and standard and was a great battle throughout the day between the local and Series players. It was one of the highest standard A Grade events that the Series has seen so far this year. Local man Mike Gregory defeated Mark Fuller in his opening match of the day before going on to do the same to Series player Luke Bishop 2-1. James Snell also overcame the challenge from experienced Racketball competitor Bishop 2-1 to set up the deciding match against Gregory. In the end Snell was to solid for Gregory who struggled with the relentless pressure and movement. 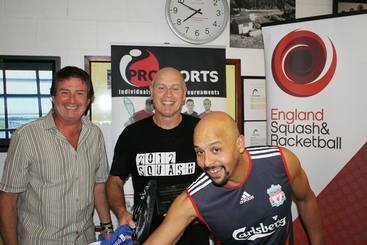 This was Snell’s second UK-Racketball Series title and the second one in a row that he has taken at Devon and Exeter. The way that he is playing it would be great to see a match up in the Nationals against Tim Vail! Paul Johnson narrowly defeated Paul Gregory in Group A 2-1 and then overcame the challenge from the groups second placed player Rob Hambrook 2-0. Brendon Bennett and Tim Gallingham were both unable to take a game off the England No.9 and highest ranked Over 40’s player on the day Jonathan Gallacher who defeated both 2-0 to win Group B.
Jonathan Gallacher continued his run of form in the final defeating Rob Hambrook 2-0 and taking the Over 40’s crown. The women’s event was the strongest that we have seen this year with 9 players including full time squash player Tory Temple-Murray and winner of 9 UK-Racketball Series titles Natalie Lawrence. In Group A Natalie Lawrence defeated both newcomer Maryann Brooks and Siobhan Garland who was recovering from injury. Tory Temple-Murray came through Group B with a similar run of form to Lawrence without dropping a game. Caroline Wright just overcame Liz Arnell 2-1 but was in tern defeated by Natalie Ackland who claimed the second spot in the group. The final was a great match. 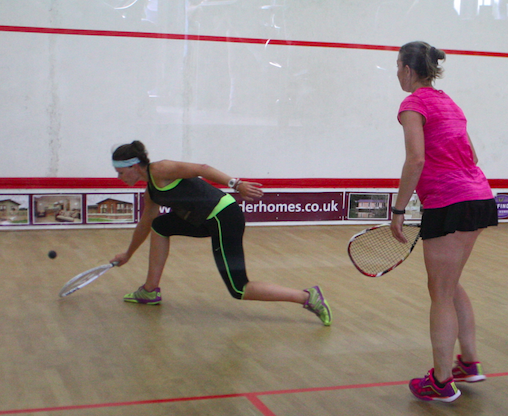 Lawrence’s Racketball experience saw her off to a great start and an early commanding lead. Temple-Murray extended the rallies and in the end sneaked the first game 11/9 after some good high quality exchanges. Temple-Murray started the second game as she finished the first moving the ball around well and putting Lawrence on the end of some tough rallies. Despite another close game the pro squash player always seemed to have the edge and took home her first UK-Racketball title. In a 4 man group it was top seed Gavin Burton who came through as the winner with Scott Murray finishing in second place. Caroline Wright was unfortunate to finish the group in third place despite over coming Paddy Martin 2 love, she did not have enough to defeat Scott Murray, losing 2-1 and finishing the group in 3rd place. Group B was one of the biggest round robins of the day with 5 competitors. Maryann Brookes came 4th defeating local racketball veteran Tim Baker. 3rd place was taken by Max Newberry who defeated Brookes and Baker 2 love in both. The battle for group champion came down to between two experienced racket ball players Lee Sadler and Natalie Lawerence. On this occasion Lawrence proved to mobile for Lee and came through 2 love. ​The B grade final was the second final that Lawernce made in the day having reached the women’s final earlier on. Despite already playing 7 matches Lawerence put up a strong fight against Burton, but was eventually beaten 2-0. Congratulations to Gavin Burton for taking the B Grade final. The over 50s draw saw two equally sided groups both with 4 players to fight it out for this years title. Newcomer Chris Davey played exceptionally well moving the ball and using pace to take group A without dropping a game. In the deciding match of Group B Mark Banfield came up against experienced Rob Watkins who despite picking up an injury managed to hang on to win the match 2-1. ​The final unfortunately did not live up to expectations, with Watkins getting injured during the day and seemed not to be getting any better. Watkins threw in the towel in the 1st game with Davey leading the game 6-3. A well deserved title for Chris Davey. A late withdrawal Graham Greensall opened up the draw up in the over 60s. Ian Monk defeated Dave Parr to take 3rd place in Group A. Second place went to Chris Hawken who was defeated by local man and group winner Max Newberry. David Mudge was unlucky to be narrowly being defeated by Martin and Clarke 2-1.Despite finishing on the same points as Martin, he finished in 3rd place due to his loss to Martin. In the group decider Martin did not have enough to overcome Clarke. It was a very well contested Over 60s final, on this occasion going the way of Clarke 2-0. 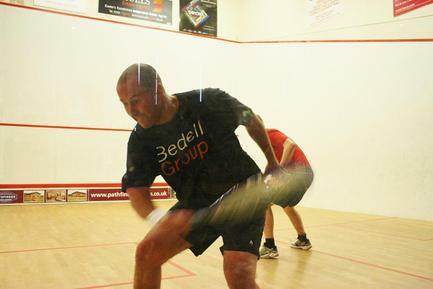 Another fantastic racketball tournament in the South West. We hope to be back again at one of the best racketball clubs in country next year. Open the attachments below to view the draws and schedules for this Saturday's tournament in Devon. The first attachment is the schedule which will tell you what time each of your matches are. The current entry list is below. If you have been missed off or are a late entry please email mark@starsportsdevelopment.com as soon as you can. With the help of ESR South West regional manager Matt Baker, racketball has really kicked off at this club. In fact, so much so that one of their courts that was converted to a gym has been reconverted back to a squash court, such is the demand for racketball.